To QE or not to QE? The FOMC meets today and tomorrow. Here's what the committee members will be discussing. 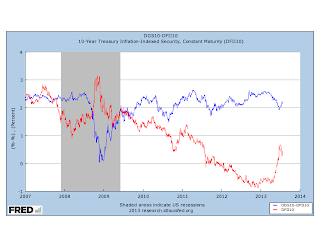 Since May, expected inflation has fallen and real bond yields have risen, as you can see in the first chart. 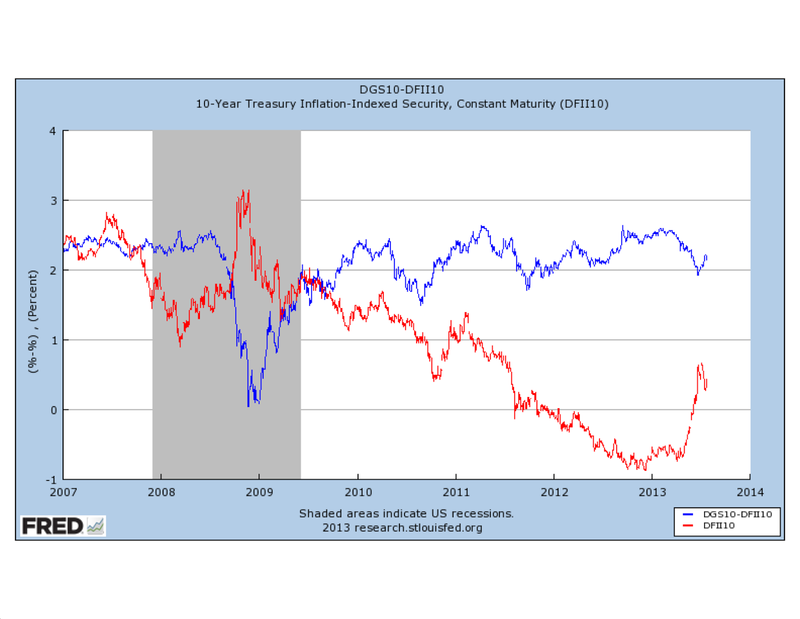 The chart shows the breakeven rate (10-year nominal Treasury yield minus TIPS yield) and the 10-year TIPS yield. The breakeven rate tends to be biased upward as a measure of anticipated inflation (TIPS insure inflation risk, and a TIPS-holder does not have to pay the Treasury if the CPI inflation rate falls below zero), but typically moves in the same direction as anticipated inflation. 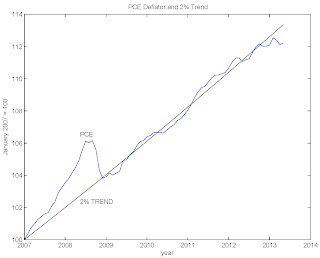 As well, if we compare the path for the PCE deflator to a 2% growth path from January 2007, we get the next chart. 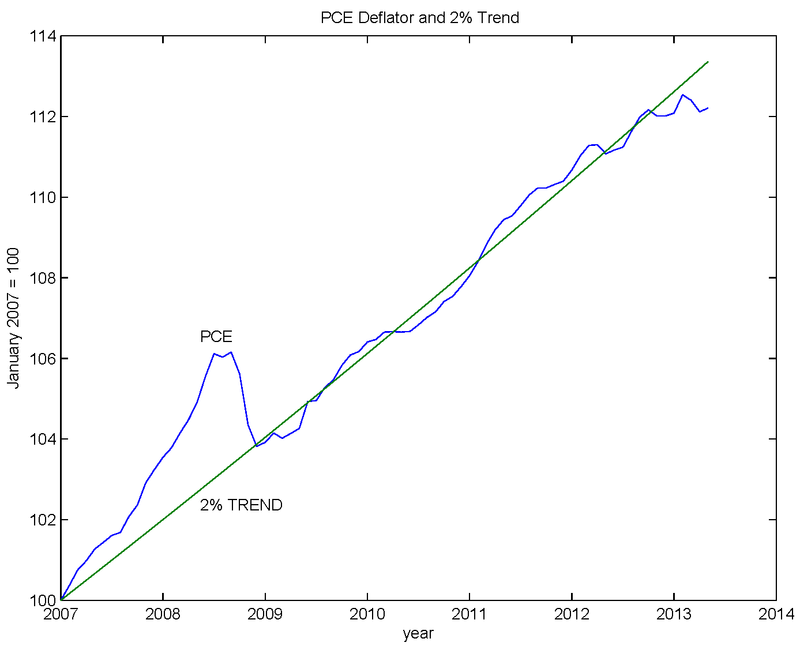 Since late 2012, the PCE deflator has been south of the 2% growth trend, and the last observation (May 2013) is about 1% on the low side. If you care about year-over-year inflation rates, you'll come to the same conclusion - the inflation rate is too low, relative to what the Fed wants. Given that the goal of the latest QE (quantitative easing) exercise, which has been proceeding at a pace of $85 billion in asset purchases ($45 billion in long Treasuries, $40 billion in mortgage-backed securities) per month since fall 2012, was to reduce bond yields and presumably to increase current and anticipated inflation, things are not moving in the right direction. 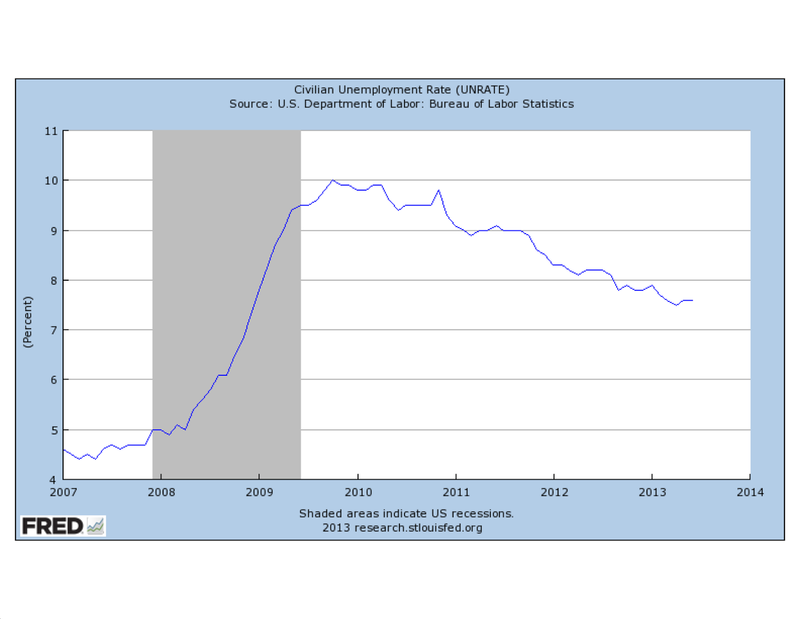 On the other side of the dual mandate, the unemployment rate is still above where the Fed wants it to be. 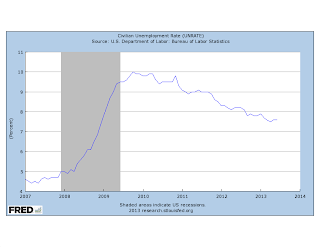 An important part of the unemployment story is what is going on with the long-term unemployed, so we can look as well at the long-term unemployment rate (those unemployed 27 weeks or more, as a percentage of the labor force). That's in the next chart. This is interesting, as about 2/3 of the reduction in the unemployment rate since it peaked has come from decreases in the long-term unemployment rate. You can see that the long-term unemployment rate is still very high relative to where it was before the last recession started (about 2.8% vs. something less than 1%). If the unemployment rate fell in the next months at the average rate of decrease from its peak until now, then it would cross the Fed's 6.5% threshold in about March 2015. This is important, as the FOMC has told us that it will not consider increasing the "fed funds rate target" (actually the interest rate on reserves) until the unemployment rate crosses the 6.5% threshold (and as long as the inflation rate is not too high). Further, Bernanke has told us, essentially in a side conversation, that the policy rate is not likely to increase immediately after the threshold is crossed. 1. If the FOMC wants to be consistent with its previous policy statements, and what Bernanke has said in public, it should plan to purchase assets at a higher rate. The news has been on the down side on inflation, anticipated inflation, and long bond yields, with nothing dramatic happening one way or the other in the labor market. So, in order to keep its promises, there should be more QE, and Bernanke should not be talking about "tapering." 2. It seems almost certain that Bernanke will not be in his current job in six months, so why do we care what he says? If we knew the next Chair would be Janet Yellen, then we care what Bernanke says now, as it seems Yellen would just follow through on that. If Larry Summers gets appointed, then things change entirely. Summers is on record as thinking that QE probably doesn't matter much, and that we might have to revise our views about what the capacity of the U.S. economy is. Maybe QE, thresholds, etc. all go out the window. In an ideal world, what should the Fed be doing? In the past I've argued that QE shouldn't matter, for quantities and prices. But suppose I were working for the Fed full time, and someone asked me to come up with a rationale for QE. What would I do? The answer is this paper, which is the best I can do at the moment, to come up with a model where QE actually makes a difference. You can read the paper to your heart's content, but here's the idea. To take QE seriously we have to be specific about fiscal policy and its relationship to monetary policy, what private financial intermediaries and the central bank can and cannot do, and the roles of assets in exchange and as collateral. The paper does all that, I think. Start with a world where the fiscal authority is doing something stupid. It issues nominal government debt - in short and long maturities - and sets taxes in such a way that the real value of the consolidated government debt is constant forever, at a value V. The central bank can issue reserves, which are perfect substitutes for short-maturity government debt, and currency. The private sector needs currency for some kinds of transactions, and there are other transactions where people trade intermediary liabilities that are backed by short and long-maturity government debt and reserves. Banks serve to allocate liquidity (currency, reserves, government debt) efficiently to the appropriate transactions. The central bank can execute asset swaps - its job is to manage the composition of the outstanding consolidated government debt, consisting of currency, reserves, short maturity bonds, and long maturity bonds. But we can't trust banks, which need to (implicitly) collateralize their deposit liabilities. The collateral consists of the bank's assets - reserves and government debt. But collateral is imperfect, in the sense that the bank can abscond with some fraction of any asset in its portfolio (a Kiyotaki-Moore problem). To get a term premium - an upward sloping nominal yield curve, it must be easier to run away with long-maturity government debt. This is definitely a short cut, as I discuss in the paper, but a useful starting point. Also, for there to be a term premium, there must be a shortage of liquidity, i.e. V must be small enough that we can't get efficient exchange - of assets for goods. What does QE do? A QE experiment involves a purchase of long-maturity government debt by the central bank, holding constant the short-term nominal interest rate. This essentially mitigates the asset shortage. The central bank is swapping good collateral for collateral that is less good. This reduces the term premium, the nominal long bond yield falls, and the yield curve flattens. So far so good for Ben Bernanke. But because collateral is now less scarce in the aggregate, real bond yields rise - at both the short and long end of the real yield curve. Further, the inflation rate falls. That's certainly not how Ben Bernanke thinks QE works. The usual story is that QE will cause real bond yields to fall and inflation to rise. In the model, QE is a good thing to do, though. Another interesting feature of the model is that, if the central bank holds the short-term nominal interest rate constant at zero, and V increases, then inflation falls, and real bond yields rise. Looks like what is going on in the first two charts, right? V is a convenient catchall in the model. Including private assets in the model (loans, equity) should not be a big deal. Better private opportunities is like having a larger V, and we could also think of higher demand for domestic government debt coming from abroad as lowering V. Currently in the real world, if we think that private investment opportunities are looking better and with a better outlook on sovereign debt problems reducing the demand for U.S. consolidated government debt, we can translate this into a reduction in the scarcity of collateral in the aggregate, and a smaller V in the model. So far so good. So what does this tell us? We're in a world where real interest rates on government debt are endogenous. Those interest rates include liquidity premia that reflect the marginal value of different classes of government debt as collateral and in financial transactions. Currently real interest rates are going up, so it should not be surprising, with the short-term nominal interest rate pegged close to zero, that inflation is falling. Conclusion: People will definitely call me stupid for saying so, but as Cartman says, screw you guys. The Fed can make all the confusing promises about the future it wants, and purchase all the assets it wants, but it may not be able to increase the inflation rate to the 2% it wants unless the nominal interest rate on reserves goes up. That's what the model says. I’ve spent five years and more watching the inflationphobes, who weren’t particularly sensible to begin with, descend into shrill unholy madness. Holy crap, who would want to be one of those inflationphobe characters? To save myself from banishment to Krugmaniac hell, I'm going to appeal to multiple equilibria. I haven't written this up yet, but I've worked out some stuff on what happens when a naive central banker, who follows a Taylor rule, and believes erroneously that the real interest rate is exogenous, goes to work in my model. 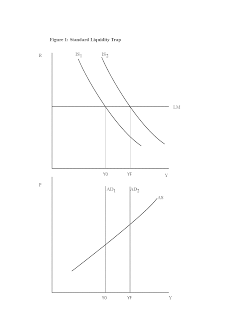 You can get two equilibria: zero lower bound, low real interest rate, low inflation, or positive nominal interest rate, high real interest rate, and high inflation. That's essentially been my point. There's nothing inherently inflationary about a large central bank balance sheet. The potential for inflation comes from how the central bank behaves given the state of its balance sheet. The multiple equilibrium story is somewhat related to this paper by Jim Bullard, with some important differences, I think. It seemed like a foregone conclusion that Janet Yellen would be the next Chairman of the Board of Governors (and hopefully would get the powers-that-be to drop the "man"), when Bernanke's term ends on January 31. But apparently some people have other ideas. As today's NYT notes, Larry Summers is being taken seriously as a contender for the job. These [large-scale asset] purchases were intended to, and I believe have, succeeded in significantly lowering longer-term interest rates and raising asset prices to help further the Federal Reserve's economic objectives. This is an easing of monetary policy, also known as accommodation, beyond what is provided by maintaining the federal funds rate close to zero. I consider these thresholds for possible action a major improvement in forward guidance. They provide much more information than before about the conditions that are likely to prevail when the FOMC decides to raise the federal funds rate. As for the date at which tightening of monetary policy is likely to occur, market participants, armed with this new information about the Committee's "reaction function," can form their own judgment and alter their expectations on timing as new information accrues over time. These thresholds will, as a consequence, allow private-sector expectations of the federal funds rate to fulfill an important "automatic stabilizer" function for the economy. If the recovery is stronger than expected, the public should anticipate that one or both of the threshold values will be crossed sooner and, hence, that the federal funds rate could be raised earlier. Conversely, if the outlook for the economy unexpectedly worsens, the public should expect a later "liftoff" in rates--an expectation that would reduce longer-term interest rates and thereby provide more-accommodative financial conditions. Yellen supports the status quo on the FOMC, and there is no reason to think that she would be much different from Bernanke as Fed Chair. QE in my view is less efficacious for the real economy than most people suppose. If QE won’t have a large effect on demand, it will not have a large effect on inflation either. So, on this, Summers and I agree, more or less. If QE matters, it's not for the reasons the Fed thinks, and the consequences may not be what the Fed thinks they are, either. But QE is not inherently harmful, or inflationary. Harm can only come if the Fed has beliefs about QE that are not correct, or if QE somehow causes political trouble for the Fed. If we have slow growth, we are not going to keep thinking that 5.5 per cent unemployment is normal. We are going to decide rightly or wrongly that the potential of the economy is less and therefore we are going to decide that we are closer to that potential and that is going to operate in favour of suggesting that we should normalise interest rates. That appears to run counter to current Fed forward guidance thresholds. The FOMC consensus appears to be that 5.5% unemployment is normal. So, Yellen would give us continuity, but Summers might shake things up a bit, perhaps in a good way. But sometimes Summers gets in trouble when he shakes things up. At the World Bank, there was the infamous Summers memo, and he didn't exactly make a lot of friends among female scientists as Harvard President. As economists we might understand better than the average person what Summers was trying to say when he opened his mouth and put his foot in it, but central bankers do well when they have the right filters between brain and mouth. An important point is that Yellen will not need to go through Senate confirmation to become Chair of the Board of Governors. She was already confirmed to be a Governor, for a 14-year term, in October 2010. The Chair is chosen from among the Governors. In cases where the proposed Chair is not already a Governor, the Senate must go through confirmation proceedings. * Possibly that won't a cakewalk for Summers, and President Obama should be worried about that, if he isn't already. In addition to offending people in developing countries, women scientists, and various faculty members at Harvard, some people have objected to Summers' perceived role in the Shleifer affair, and this may have had something to do with his resignation as President of Harvard. I have no opinion on this, as I don't know anything about it, but obviously some people think they know things, and they have strong opinions. And Summers has to carry that baggage into confirmation proceedings. But, enough about Yellen and Summers. If you were to ask me (not that anyone is), I would advise following the lead of the Bank of England. Appoint a Canadian! As everyone knows, Canadians have superior leadership abilities, are excellent economists, and understand financial stability really well. But which Canadian? Tiff Macklem, current Senior Deputy Governor of the Bank of Canada, would be great. The fact that he's not a U.S. citizen could put the kabosh on that idea, but maybe he's a secret American - his mother took a trip to Plattsburgh to give birth, or some such. For people who want a basic explanation of where New Keynesian models came from, why central bankers find them attractive, and a critique, from a policymaker's point of view, this speech from a couple of months ago by Charles Plosser is helpful. George Selgin had a bad experience with a commenter on this post. I know how he feels. It's too bad if some people accept as gospel that some ideas are good, evil, right-wing, or left-wing, and suspect the motives of people they think are on the other side of the political divide. It's hard to have a sensible discussion about economics in that context. Paul Krugman seems worried that Noah Smith has been bitten by a zombie, or otherwise thrown into a discombobulated state. Noah's sin is to have suggested that what is going on in a New Keynesian model may not shed much light on what is going on in Japan. The basic Woodford framework confines attention to sticky prices as a friction that creates inefficiency that can be corrected by monetary policy. Monopolistically competitive firms can change prices infrequently - say, through a Calvo pricing mechanism - and unanticipated shocks can lead to relative price distortions that monetary policy can act to mitigate. But, those relative price distortions will disappear in the long run as prices adjust. Noah seems to think that 20 years (in the Japanese case) gets us pretty close to full adjustment, and I agree. Indeed, with the frequency of price changes we observe in the data (e.g. Klenow et al. ), the same argument would seem to apply to our current predicament. It has been five years since the shock hit that produced the last recession in the United States. If we think that the current state of the US economy is somehow inefficient - i.e. there is some set of policies that could improve matters - it seems we should not be thinking about sticky prices as the source of that inefficiency. This New Keynesian model corresponds nicely to the simple AD-AS model that people learn in Econ 102. You can forgive Noah for thinking this, as a lot of effort on the part of Woodford (in his book and published papers) and other New Keynesians has has gone into making it appear that New Keynesian economics is somehow the same thing as AD-AS, or in fact an excuse for taking that shortcut. The basic New Keynesian model is actually a real business cycle model with Dixit-Stiglitz monopolistic competitors and sticky prices, which owes more to Ed Prescott than to Keynes. Without the word "Keynesian" attached to it, Keynes would not recognize the structure as having anything to do with him, and it's doubtful the first person who put an AD-AS model into an undergraduate textbook would recognize it either. Krugman is certainly sold on the idea that AD-AS and Woodford macroeconomics are the same thing. According to Krugman, we can do really well with AD-AS, though sometimes we might have to "check" what we are doing by going to the full-blown New Keynesian model. In the case of Noah's post, Krugman thinks Noah's analysis is flawed because of his failure to take account of the liquidity trap, and otherwise falling short in adhering to Krugman's talking points. Krugman has two models he likes to think about. One is AD-AS, and the other is in his paper with Eggertsson. But he wants to think of those as the same thing. So let's take the AD-AS route, as that's easier. What is Krugman trying to say? Set the wayback machine, Sherman, and off we go. I'm now imagining myself in a macro class in 1975, where I learned what was in the first edition of Branson's book. This is something like playing with an 8-track player you found in your basement. The thing works - in the sense that you can make it do what it was built to do - but you know while playing with it that you are wasting your time. Figure 1 shows you the IS-LM, AD-AS part of the model. 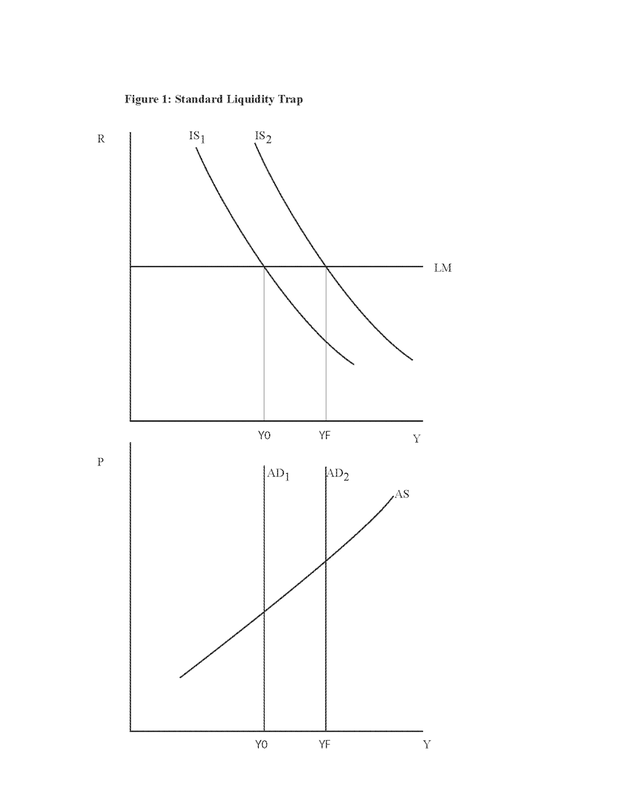 This is the liquidity trap case. The LM curve is flat. Equilibrium output Y0 is less than full employment output YF. Why is the AD curve vertical? That's because changes in prices don't do anything in the IS-LM portion of the diagram, as real money demand is perfectly elastic at the zero lower bound. 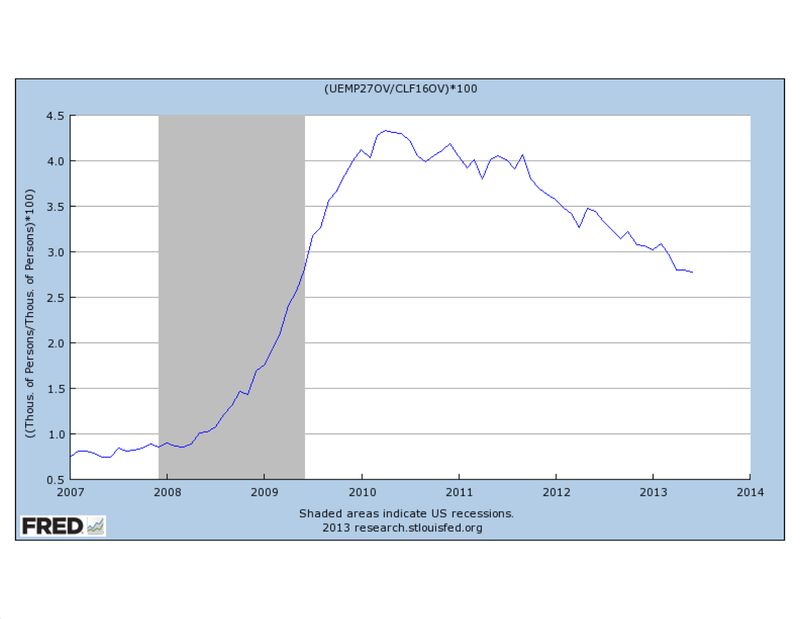 So, in the absence of some kind of intervention, this economy remains stuck below full employment forever. The fix is fiscal policy - increase G, shift the IS curve, and we go to full employment output. But, as I was taught in my intermediate macro class, Pigou had a fix for this. 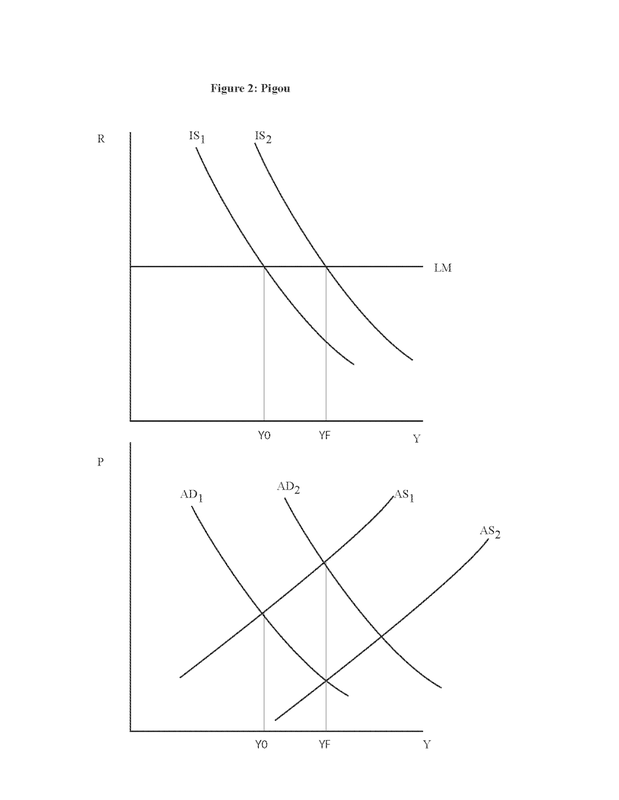 If there's a wealth effect on consumption, for example, then you get a downward-sloping AD curve, as in Figure 2. In the short run, output is less than full employment, but if we let prices adjust, then over time the nominal wage falls, shifting AS to the right, and we get full employment. But the short run fix, as in Figure 1, is fiscal policy, which gets us there faster without the bother of waiting for the price adjustment. 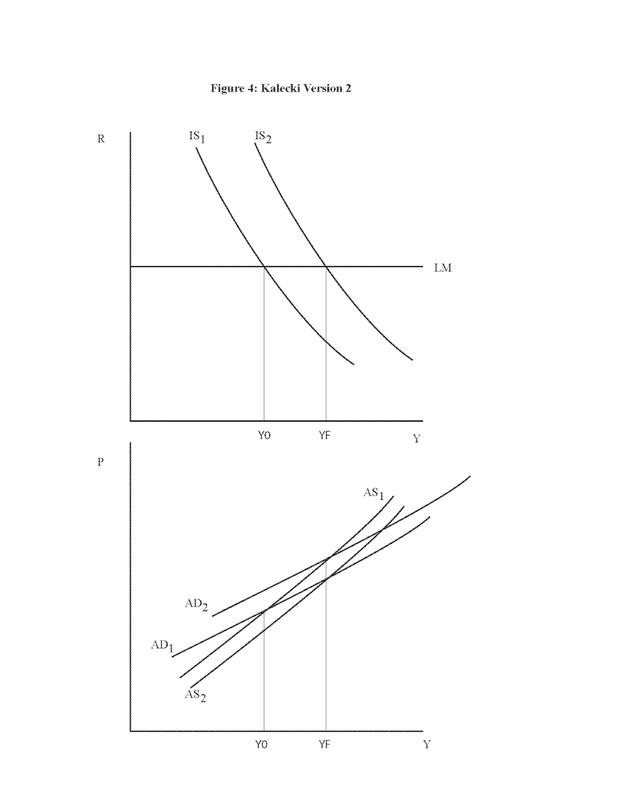 But Figures 1 and 2 are not what Krugman has in mind. He's barking up Kalecki's tree, apparently. Kalecki argued that a deflation would increase the real value of debts denominated in nominal terms, and that the wealth effect would go the other way. 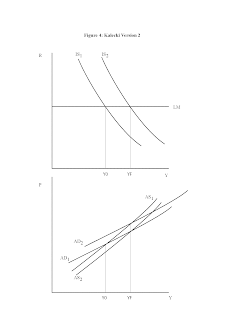 This gives you a positively-sloped AD curve, which Eggertsson and Krugman indeed coax out of their New Keynesian model. 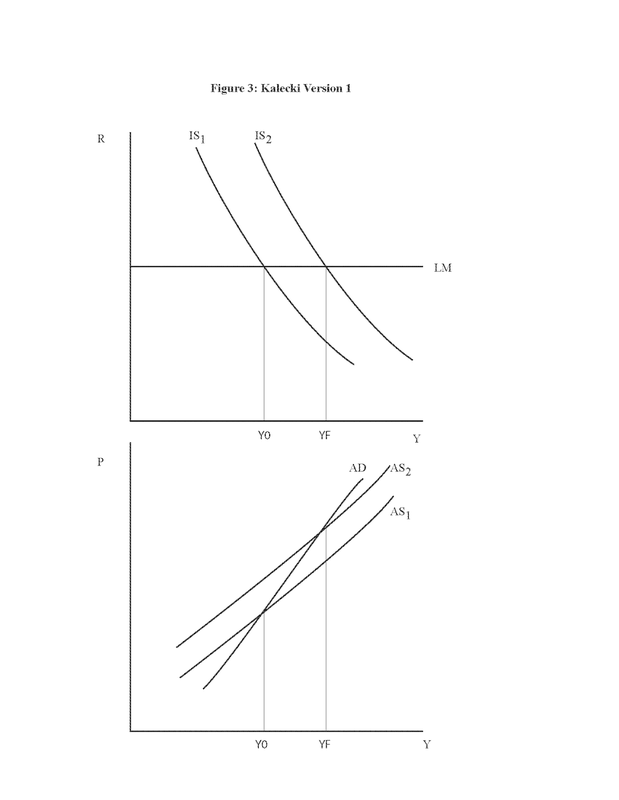 The key question is, with the Kalecki effect in there, is the slope of the AD curve greater or less than the AS curve? Let's do it both ways. First in Figure 3, suppose AD is steeper than AS. In this case, long-run adjustment to full employment occurs through an increase in the nominal wage. This occurs because there is an excess demand for labor. 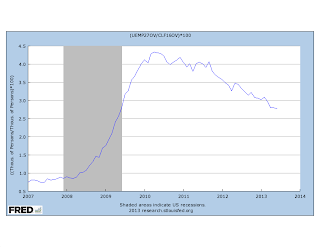 But I don't remember Krugman arguing that the labor market is currently too tight (maybe you do?). He must be thinking about the other case. So, in Figure 4, AS is steeper than AD. In this case, in the long run we have to wait for the nominal wage to fall, shifting AS to the right. Krugman says that wages are really sticky downward, so we don't want to wait that long. What's the short-run cure? 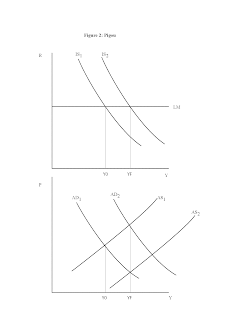 Well, the problem is that there is too much aggregate demand. We want to shift AD to the left. Austerity will work nicely. Again, I don't remember Krugman pushing for that, but maybe you do. Krugman might want to appeal to Eggertsson/Krugman as the ultimate truth with respect to issues he discusses in his blog, but that paper has its own problems. It's a superficial treatment of debt contracts and default, and uses linearization to characterize the zero-lower-bound equilibrium, which is known to be misleading. 1. Most of the macroeconomics done since 1970 was a waste of time. 2. The exception to (1) is New Keynesian economics. 3. New Keynesian economics and textbook AD-AS are essentially the same thing. 4. Wages and prices are sticky. 5. Wage and price stickiness are the primary source of current inefficiencies in the U.S. economy. 6. Relative to what is efficient, GDP is currently too low, and the unemployment rate is too high. 7. We can correct the inefficiencies that currently exist with an expansion in government expenditure on goods and services. That narrative is a web of contradictions, and hardly internally consistent science. The AD-AS model somehow persists in textbooks, which causes it to retain its power as a tool for communicating with people who have only a smattering of economics training. Krugman exploits that, and so have New Keynesians, but that behavior doesn't serve the cause of science. I ran across an interesting piece by George Selgin. He makes a point that a lot of people miss, including, in this case, Gary Gorton. History gives us useful information for organizing our thinking about financial crises (and other events of course), but many people attach too much weight to U.S. experience. This matters in particular for how we address the issue of whether financial fragility is inherent or induced. If we confine our attention to U.S. financial history, we might think that banks are inherently unstable, as Diamond and Dybvig theorized. We also might think, if we look at the performance of behemoths like Bank of America and Citigroup, that too-big-to-fail could be an inherent problem in banking. But, as Selgin points out, the notion that banking arrangements are inherently prone to panics and too-big-to-fail problems flies in the face of experience in other countries - Canada in particular. The kind of thinking Selgin objects to leads to inappopriate policy conclusions. Gorton in particular seems to subscribe to the idea that a fix which will make the banking system safe is some version of narrow banking - restricting what financial intermediaries can hold as assets to back any type of transactions account. But there are other - and seemingly better - ways to get safety (if you want it), as the Canadians have shown.